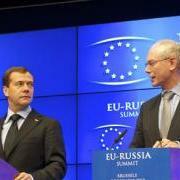 BRUSSELS — The European Union and Russia are set to meet on January 28 for their biannual summit. These events, usually box-ticking affairs, have rarely served as venues for honest debate about tough issues. But this time frustrations seem to have exceeded courtesies and the planned two-day summit has been cut to a restricted three-hour meeting. While relations between Europe and Russia have matured significantly in technical areas such as trade, energy, tourism, and education, Europeans were never prepared for Russian President Vladimir Putin plunging them into a vicious zero-sum game over the fate of Central and Eastern Europe. Europeans are angered at Russia’s role in dissuading post-Soviet states from seeking a rapprochement with Brussels. Russia’s probing of Europeans’ weaknesses, and Europe’s difficulties in dealing with it, has led to stagnation and much mistrust. Moscow’s assertive diplomatic use of energy security, punitive trade measures, moneylending, and military might has successfully weakened EU strategies aimed at offering greater economic integration with many post-Soviet states in return for good governance. And with plans in the making for a Eurasian Union between Russia, Belarus, Kazakhstan, and potentially also Ukraine, Armenia, Tajikistan, and Kyrgyzstan, Putin might become even more successful at keeping Europe out of what he considers Russia’s legitimate sphere of influence. As a result, Europe’s eastern neighborhood is not transforming into a region of liberal, well-governed countries, but into a collection of economically weak nation-states ruled by semi-authoritarian regimes loyal to Moscow. Brussels’ response to this challenge has been minimal. But the EU is not completely to blame for being at risk of losing its East. The responsibility lies with the member states who have found it difficult to stick together and provide Brussels with the necessary tools to act like a serious geopolitical actor. In the long run, the failure to adopt a credible neighborhood policy will probably mean more difficulty in managing tensions with Russia. An immediate priority for European leaders should be taking a fresh look at how they deal with their eastern neighborhood. The Vilnius Summit last November gave the final blow to an EU policy that too closely followed the enlargement process without giving partner countries the prospect of actual EU membership. Moreover, the benefits that the EU offers in exchange for political reform are dwarfed by some of the sums pledged by Moscow to aid certain countries’ financial woes. But despite setbacks, the EU must make clear that it remains committed to the region’s modernization and development. An important signal would be to redesign and launch an updated Ostpolitik. Measures could range from helping countries diversify their sources of energy to opening up the European single market for specific products, without necessarily having to tie countries to a comprehensive trade agreement. Another priority is to keep pushing for socio-political change within Russia. Here Germany could play an invaluable role. Even as the cozy camaraderie between Berlin and Moscow has come to an end, Germany’s value-based foreign policy combined with its leading investment position in the Russian economy can help spur the modernization of Russian society and pressurize elites to respect civil rights and the rule of law. At the same time, Chancellor Angela Merkel should hold firm to her position that countries in Europe’s neighborhood must be able to decide about their own future. Germany has the strength to mobilize European support and resources to assist countries like Moldova and Georgia that seek to sail a more independent course from Moscow. In that respect, Germany will find committed allies in countries like Poland and Sweden that can help Berlin embed efforts into a wider EU strategy. Finally, the EU must find the guts to put economic and hard security on top of the bilateral agenda with Moscow. It cannot shrug its shoulders to the routine violations of Latvian, Estonian, Lithuanian, Polish, Finnish, Swedish, or British airspaces by Russian warplanes. And now that Russia is a member of the World Trade Organization, the EU can call out Moscow for its suspicious trade blockades, like Russia did with European meat, fish, and milk exports. Moreover, as Europe’s neighborhood has become Russia’s near abroad, Europeans must work to stabilize this region, which is important for energy supplies or immigration challenges. But Moscow’s refusal to reduce its military presence in the region’s frozen conflicts has kept certain countries in dysfunction for over a decade. And in the cases of Transnistria, Abkhazia, and South-Ossetia, Russia’s growing military and diplomatic presence in these breakaway provinces seems to be a direct challenge to Moldovan and Georgian aspirations to seek closer ties with the European Union. For Europe, maintaining dialogue and cooperation with Russia is important, but it cannot do so by resorting to its usual laissez-faire attitude. A failure to address the tough questions would only lead to more stagnation. Bruno Lété is a senior program officer for foreign and security policy with the German Marshall Fund of the United States in Brussels.